The Refine Edge feature has been completely revised for Photoshop CS5 and now has the WOW factor when it comes to creating composite images. Mark Galer gives it a test drive. One of the most challenging montage or masking jobs in the profession of post-production editing used to be the hair lift. When the model had long flowing hair and the subject needed to change location many post-production artists would call in sick. If you got it wrong, just like a bad wig, it showed. Extract filters, Magic Erasers and Tragic Wands didn’t get us close but we now have a new Refine Edge feature in CS5 that has eased the burden of this task and made the task easier than ever before. The first step to ensure guaranteed success should be completed before you even press the shutter on the camera. To increase the chances of success you should try to photograph your subject against a featureless background that has a different tone or color to the model’s hair. This important aspect of the initial image capture ensures that the resulting hair transplant is seamless and undetectable. The post-production is now the easy bit – simply apply the correct sequence of editing steps for a perfect result. This is not brain surgery and there are no lengthy selection procedures required (the Refine Edge and Channels panel holds the secret to success). A rough selection can be made using the Quick Selection Tool from the Tools panel with the Auto-Enhance option checked in the Options bar. If you accidentally select some of the background just hold down the Alt/Option key and drag across this area to subtract it from the initial selection. Go to Select > Refine Edge and from the View Mode drop-down menu choose the On Layers option. This will give you the most accurate view when you refine the edge of your mask. Don’t worry about any areas of the old background that may appear in the preview window at this stage. Increase the Radius in the Edge Detection section of the dialog so that it covers the less well define edges of your subject. We could use the Shift Edge slider to try to remove the white halo that will sit around the edge of your subject but the most effective way to do this is to use the new Decontaminate Colors feature. Check the Decontaminate Colors checkbox and raise the Amount slider. You should now have an appropriate edge quality with all traces of the old background removed from all the edges except the hair. If you forgot to use the Auto-Enhance feature when you made the initial selection you may need to raise the Smooth and Feather sliders slightly in the Adjust Edge section of the dialog. To remove all traces of the old background from around the hair, select the Refine Radius Tool and paint over any areas where there may be hair. There is an Options bar for controlling the brush size and switching to the Erase Refinements Tool. After a painting action there will be a short delay while Photoshop decontaminates the colors (replaces the old background pixels with pixels of a more appropriate color) and rebuilds the preview. In the Output To menu, select the New Layer with Mask option and then select OK. If you hold down the Shift key and click on the Layer mask on the copy layer to switch the mask off you will be able to observe what Photoshop has been trying to do in order to decontaminate the white pixels that surround the subject. Colors from the subject itself have flooded the background to ensure a seamless composite view. Note also how the visibility of the original layer has been switched off automatically after exiting the Refine Edge dialog. If you are using a smart object the layer will also be rasterized in the process. The improved capabilities of the Refine Edge dialog certainly has the WOW factor, as it allows basic users to create seamless montages and saves valuable time for post-production professionals. This has to be one of the most powerful new features in the main editing space of Photoshop CS5. 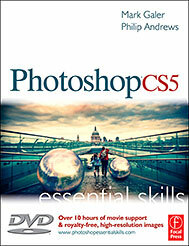 An extended version of this project can be found in the book Photoshop CS5: Essential Skills by Mark Galer and Philip Andrews. A practical guide to creative image editing Photoshop CS5:Essential Skills will help you to master the essential features and tools of this awesome software. Broken into three parts to form a structured, self-study guide, the book covers foundation skills and more advanced techniques, with a complete section of step-by-step imaging projects so you can practice your skills and create professional-looking results.